Queens, NY - U.S. Representative Alexandria Ocasio-Cortez wasted no time on Thursday in calling Amazon’s decision to scrap plans to build a major New York outpost with nearly $3 billion in city and state incentives a big victory for progressive politicians. The democratic socialist congresswoman has become the face of the Democratic Party’s ascendant left wing, thanks in part to her upset victory last year in a district near the proposed Amazon.com Inc development. “Anything is possible: today was the day a group of dedicated, everyday New Yorkers & their neighbors defeated Amazon’s corporate greed, its worker exploitation, and the power of the richest man in the world,” Ocasio-Cortez wrote on Twitter. Amazon blamed local opposition for its abrupt reversal, which some saw as the latest evidence of the progressive movement’s surging influence ahead of the battle for the Democratic presidential nomination next year. Amazon had already been a favored target for some left-wing politicians due to its dominance of online shopping and reputation for imposing difficult work conditions on warehouse workers. The company has defended its practices and last year raised its minimum wage to $15 an hour, more than twice the federally mandated level. But since Amazon announced plans for its so-called HQ2 in 2017 and began soliciting bids from hundreds of U.S. cities, the political environment in both New York and the country has shifted significantly. Last fall, Democrats swept to victory in the U.S. House of Representatives, buoyed by left-wing energy and animus toward Republican U.S. President Donald Trump. In New York, Democrats took control of the state Senate from Republicans for the first time in a decade. Democratic leaders in the state Senate then nominated Michael Gianaris, whose district includes the proposed Long Island City Amazon site, to a little-known state board that could have vetoed the project. Gianaris, a Democrat, was a vocal critic of the billions in subsidies offered to Amazon despite initially calling on the company to consider New York. “This was a shakedown, pure and simple,” Gianaris told reporters on Thursday. Critics of the deal questioned why the third-most valuable company in the United States – with a chief executive, Jeff Bezos, who ranks as the world’s wealthiest man – required that level of public funding, including tax breaks and grant money. 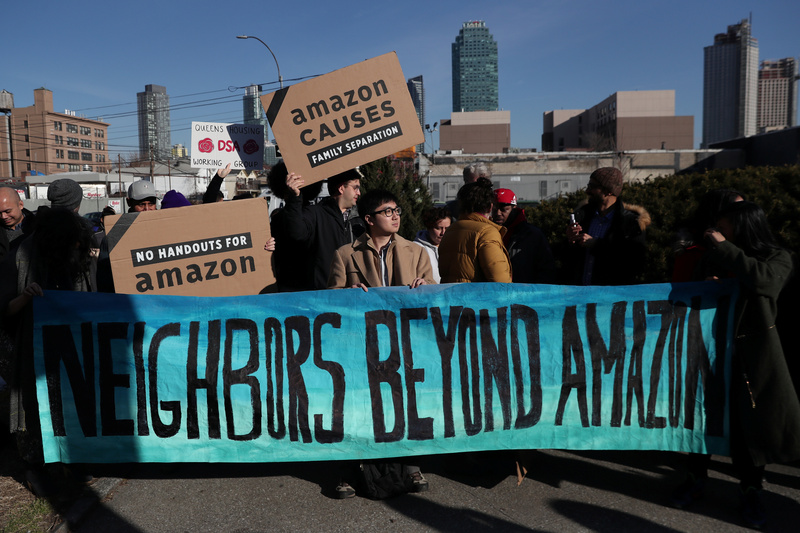 Amazon also faced anti-gentrification sentiment in a city where income inequality and a lack of affordable housing have become major concerns. Some labor leaders opposed the deal unless Amazon agreed not to oppose unionization efforts, a position that the company representatives rejected. Still, public polling suggested the deal, which Amazon said would eventually create at least 25,000 jobs, was fairly popular among New Yorkers. Democratic Mayor Bill de Blasio, an enthusiastic backer of the project, faced outrage from left-wing activists who questioned how he could defend the subsidies while staying true to his liberal principles. But he and Governor Andrew Cuomo, a fellow Democrat who spent the last year burnishing his own progressive bona fides while running for another term, had argued that the deal’s job creation benefits far outweighed any cost. In a statement, Cuomo cast blame on a “small group of politicians” he accused of putting political interests ahead of their constituents’ needs. De Blasio, by contrast, put the blame on Amazon for refusing to address local concerns. The definition of progressive progress - the loss of 25,000 jobs. A true victory - a total economic collapse. But don't worry, we will still be able to tax the rich to send illegals to college and support those unwilling to work. Real voodoo economics. Well said .Just a shame all our wonderful Progressives don't really care about anything ,except their own opinion !!!! How stupid these people are they want everything for free except to work! good riddance of a liberal Trump hating billionaire. They need to learn finance 101. These people make Deblasio look like a conservative. You new york fools elected occasional-cortex, and shmukky schumer, and jew hating Gillebrand & DeBlooser.